Carol Caldwell-Edmonds, an IT professional at the University of Vermont, is the latest recipient of the Flynn Center’s Vermont Artists’ Space Grant. She’s been using her 10 weeks of free studio space to stage The Guinevere Project, a musical in which live actors and digital animations interact on stage, and will present a work-in-progress showing at the FlynnSpace this Sunday. The story is fittingly techy: A video-game designer named Irene is researching the subject of her latest game, King Arthur’s famed queen, Guinevere. Along the way, Irene encounters the mythology expert — and native Vermonter — Norma Lorre Goodrich, who is credited with unearthing the real-life origins of the King Arthur story. Guinevere, we learn, was actually a Scottish high priestess of the dead. In The Guinevere Project, Caldwell-Edmonds juxtaposes two virtual realities, the theater and digital game space. Her human actors interact with digital ones through a simple construction: Animated characters are projected on a white sheet, then reflected onto an angled pane of Lexan glass — the stuff used to line hockey rinks, points out Caldwell-Edmonds’ daughter, Shannon Edmonds. Live actors stand behind the glass, making them appear to move among the digital ones. Caldwell-Edmonds is on her own quest: to return to her roots in music and art. She studied music in college and has always liked theater, she says, but this is her first play. She’s had plenty of help. Shannon Edmonds animated the characters with a small group of students from the Center for Technology, Essex. Vermont artist Wendy Copp drew the prototype for Goodrich, who appears digitally. And Caldwell-Edmonds’ son, Ben Edmonds, helped arrange the music. 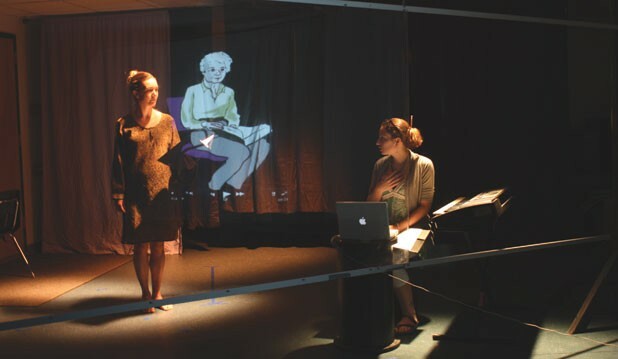 Incorporating virtual characters into a physical play may seem like a very 21st-century endeavor, but the technique known as Pepper’s ghost, in which lights and plates of glass are used to create onstage illusions, has been around since the late 1800s. This one just has video games and Flash animation.